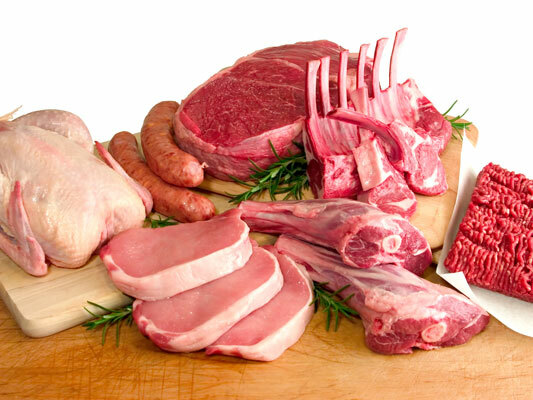 Beef, pork, lamb, and veal are hearty and delicious protein options, but they’re generally higher in saturated fat than other types of protein such as poultry and fish. You can enjoy lean cuts of pork without jeopardizing your healthy-eating goals. You can enjoy lean cuts of pork and other hearty proteins without jeopardizing your healthy-eating goals. In a shallow bowl, combine the bread crumbs and Parmigiano-Reggiano cheese. Dip the pork chops in the egg mixture, and dredge in the bread crumb mixture. In a large nonstick skillet, heat the olive oil. Add the pork chops and brown on both sides. Reduce the heat, cover, and sauté for 3–5 minutes. Remove cover and cook 5–10 minutes more until the pork is no longer pink, and a meat thermometer inserted in the thickest part of the meat reads 145 degrees. Squeeze 2 or 3 lemon wedges over the chops. Transfer to a serving platter, garnish with the remaining lemon wedges, and serve. Chicken, turkey, veal, beef, and fish fillets can also be prepared this way. Per serving: Choices/Exchanges 1/2 Starch, 3 Lean Protein, 1/2 Fat; Calories 200 (from Fat 100); Fat 11g (Saturated 3.0g, Trans 0.0g); Cholesterol 90mg; Sodium 170mg; Potassium 280mg; Total Carbohydrate 8g (Dietary Fiber 1g, Sugars 1g); Protein 19g; Phosphorus 190mg. In a medium nonstick skillet, heat the olive oil. Add the apple slices, and sauté until just tender. Sprinkle with cinnamon and nutmeg, remove from heat, and keep warm. Place the pork chops in the skillet and cook thoroughly; a meat thermometer inserted into the thickest part of the meat should reach 145 degrees. Remove the pork chops from the skillet, arrange on a serving platter, spoon the apple slices on top, and serve. Cinnamon is beneficial in regulating blood sugar levels. Consider serving this dish with baked sweet potatoes or quinoa, also sprinkled with cinnamon. Chicken and turkey also work well in this recipe. Per serving: Choices/Exchanges 1 Fruit, 2 Lean Protein, 1 Fat; Calories 210 (from Fat 90); Fat 10g (Saturated 2.6g, Trans 0.0g); Cholesterol 45mg; Sodium 35mg; Potassium 340mg; Total Carbohydrate 15g (Dietary Fiber 3g, Sugars 11g); Protein 16g; Phosphorus 145mg.